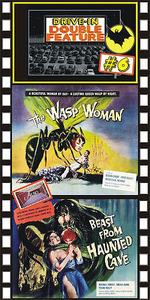 THE WASP WOMAN (1959) Susan Cabot, Michael Mark, Fred Eisley, directed by Roger Corman. Well done, low budget sci-fi. A scientist creates an amazing youth-restoring beauty cream for the aging head of a cosmetics firm. To her amazement, she finds that it works! One problem, though: she also finds herself occasionally changing into a horrible, wasp-headed monster! 16mm. Plus: BEAST FROM HAUNTED CAVE (1959) Michael Forest, Sheila Carol, Frank Wolff. Gangsters hiding in a mountain cabin are killed off by a horrible monster who’s the resident of a local cave. A Roger Corman film although his name isn’t in the credits. Neato. 16mm.